We propose a penalized spline approach to performing large numbers of parallel nonparametric analyses of either of two types: restricted likelihood ratio tests of a parametric regression model versus a general smooth alternative, and nonparametric regression. Compared with naively performing each analysis in turn, our techniques reduce computation time dramatically. Viewing the large collection of scatterplot smooths produced by our methods as functional data, we develop a clustering approach to summarize and visualize these results. Our approach is applicable to ultra-high-dimensional data, particularly data acquired by neuroimaging; we illustrate it with an analysis of developmental trajectories of functional connectivity at each of approximately 70000 brain locations. Philip T. Reiss, Lei Huang, Yin-Hsiu Chen, Lan Huo, Thaddeus Tarpey, and Maarten Mennes (2014). 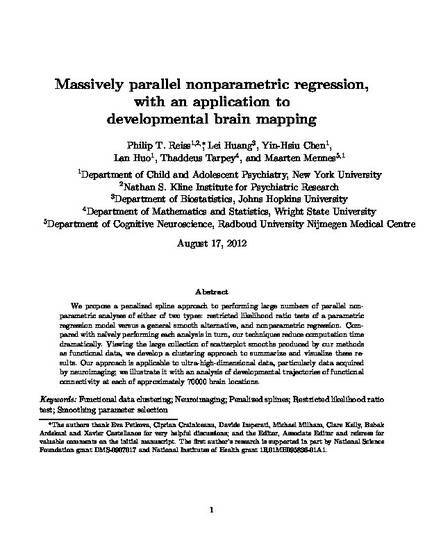 Massively parallel nonparametric regression, with an application to developmental brain mapping. Journal of Computational and Graphical Statistics 23(1): 232-248.